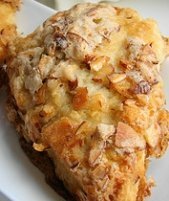 I love these homemade almond scones. The triple-whammy flavor hit here is - almonds. Toasted ground almonds, pure almond extract and sliced almonds on top. Serve with lots of butter. This recipe is from Dorie Greenspan's cookbook: Baking from My Home to Yours. Divide the toasted almonds in half. Finely grind 1/2 cup in a blender or food processor with the sugar, taking care not to over blend and end up with almond butter. Finely chop the other 1/2 cup of almonds. Stir the egg, cream, milk and almond extract together. Whisk the flour, ground almonds with sugar, baking powder and salt together in a large bowl. Drop in the butter and using your fingers, toss to coat the pieces of butter with flour. Quickly, using your fingertips, or a pastry blender, cut and rub the butter into the dry ingredients until the mixture is pebbly. You will have pea size pieces and everything in between - and that’s just right. Still in the bowl, gently knead the dough by hand, or turn it with a rubber spatula 8 to 10 times. Lightly dust a work surface with flour and turn out the dough. Divide it in half. Working with one piece at a time, pat the dough into a rough circle that’s about 5” in diameter. Now cut it into 6 wedges and carefully place them on the baking sheet. Top with sliced almonds if you are using them. At this point, the scones can be frozen on the baking sheet and then wrapped airtight. Don’t defrost before baking - just add two more minutes to the baking time. Bake the almond scones for 20 to 22 minutes, or until the tops are golden and firm-ish feeling. Transfer to a rack and cool for 10 minutes before serving, or wait for them to cool to room temperature.